I have no doubt that we will be successful in harnessing the sun's energy. 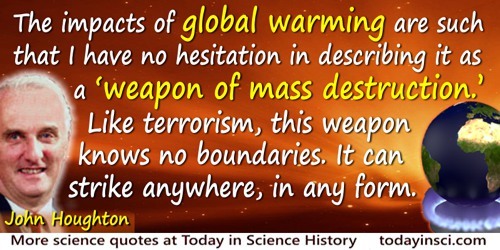 … If sunbeams were weapons of war, we would have had solar energy centuries ago. 'Sayings of the Week.' The Observer, London (26 Aug 1973). Quoted in Barbara K. Rodes and Rice Odell, A Dictionary of Environmental Quotations (1992), 265. In the arts of life main invents nothing; but in the arts of death he outdoes Nature herself, and produces by chemistry and machinery all the slaughter of plague, pestilence and famine. 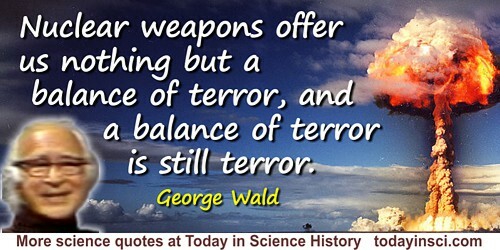 … There is nothing in Man's industrial machinery but his greed and sloth: his heart is in his weapons. I’m not going to fight in the physical with physical weapons, because it’s not a physical fight. I’m going to fight with spiritual weapons, cause it’s a spiritual fight. Reductio ad absurdum, which Euclid loved so much, is one of a mathematician's finest weapons. It is a far finer gambit than any chess play: a chess player may offer the sacrifice of a pawn or even a piece, but a mathematician offers the game. In A Mathematician's Apology (1940, reprint with Foreward by C.P. Snow 1992), 94. Science is one of our best weapons against authoritarianism, but authoritarianism has been known to surface among scientists. When this happens, misguided perfectionists or romanticists sometimes seek to root it out by attacking science. Instead of destroying science, which would merely return us to ignorance and superstition, what we need to do is to expose and root out the authoritarians. In How to Tell the Liars from the Statisticians (1983), 129. Structures are the weapons of the mathematician. The last few centuries have seen the world freed from several scourges—slavery, for example; death by torture for heretics; and, most recently, smallpox. I am optimistic enough to believe that the next scourge to disappear will be large-scale warfare—killed by the existence and nonuse of nuclear weapons. Alvarez: Adventures of a Physicist (1987), 152. The simple rule about weapons is that if thery can be built, they will be built. There is no such thing as a good nuclear weapons system. There is no way to achieve, in the sound sense, national security through nuclear weapons. Why the dinosaurs died out is not known, but it is supposed to be because they had minute brains and devoted themselves to the growth of weapons of offense in the shape of numerous horns. However that may be, it was not through their line that life developed. In 'Men versus. Insects' (1933), collected in In Praise of Idleness and Other Essays (1935), 199.